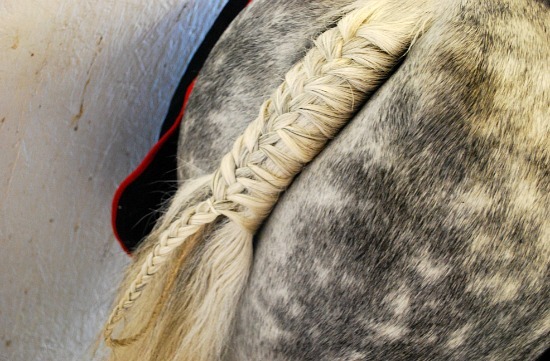 You can only do this on your horse if you haven’t pulled or clipped the top of your horses tail – ie it’s fully grown. Start at the top of the tail and get three bits of the hair – twist them into one plait – then take another strand of hair from the side of the tail and work that into the plait like you would a French plait. Keep going, using this process until you’re about two thirds of the way down the tail bone. Basically you’re using the hair to wrap up like a sausage the rest of the hair and tail. Two thirds of the way down stop threading in the outer bits and just do one long plait with the remaining hair. When that’s done take the end and tuck it under the bottom of the French plait and secure with a band. It should be a loop.